► 4 CAVITIES - Makes 4 Skull Shape Ice Drink Chillers at the same time, keeps your whiskey, cocktail or other beverages chill for longer time, COOL drink, COOL life. ► BPA FREE SILICONE - Made of food grade silicone, dishwasher safe. The smells exists for every silicone products, so please clean it before making ice cubes. ► DIMENSIONS - Size of the ice cube tray is 5.3*3.6*2.3 inches; the skull ice balls you will make are greater than 1.5 inches. ► EASY TO RELEASE - It\'s easy to release the cover with flexible silicone molds, you may also freeze other drinks, such as milk, coffee, chocolates, juices, etc. It\'s not suggested to fill with too much water on the lid. 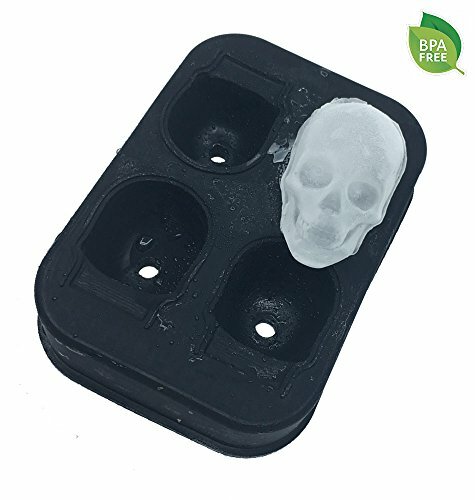 ► NO RISK PURCHASING - 100% Money back guarantee, if you are not satisfied with the 3D Skull Ice Cube Mold, just let us know, you\'ll get fully refund.